Cliffhanger - 4K UHD Review - ReDVDit! Cliffhanger is a 1993 American action adventure film that was directed by Renny Harlin and stars Sylvester Stallone, John Lithgow, Michael Rooker, and Janine Turner. Based on a concept by climber John Long, the film follows Game (played by Stallone, who co-wrote the screenplay), a mountain climber who becomes embroiled by the failed heist of a U.S. Treasury plane flying through the Rocky Mountains. Stallone later said that “the director’s cut was met with a lot of disapproval at the screening and received some alarmingly low scores. Mainly because the stunts were absurdly overblown. For example, the average man can jump maybe twelve feet across a gorge, and the stunts had me leaping maybe three hundred feet or more, so situations like that had to be pared down and still were faily extreme… so you’re probably better off with this cut. 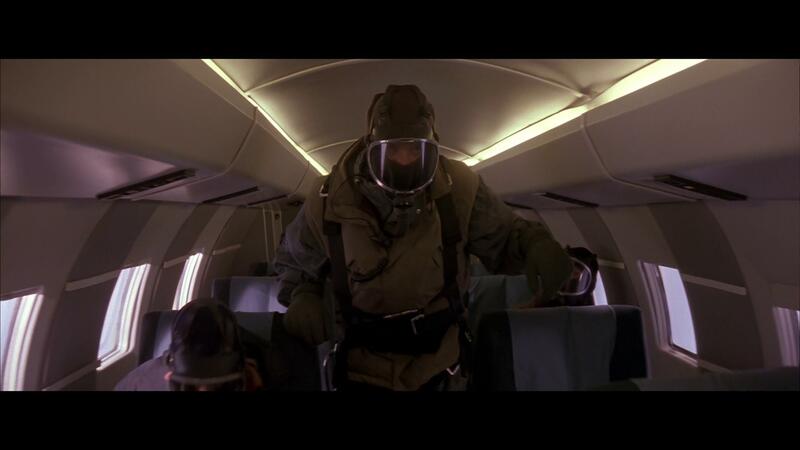 By the way, the 2nd unit crew that filmed the majority of the action was extraordinary.” The film was screened in out of competition at the 1993 Cannes Film Festival, and was nominated for three Academy Awards. 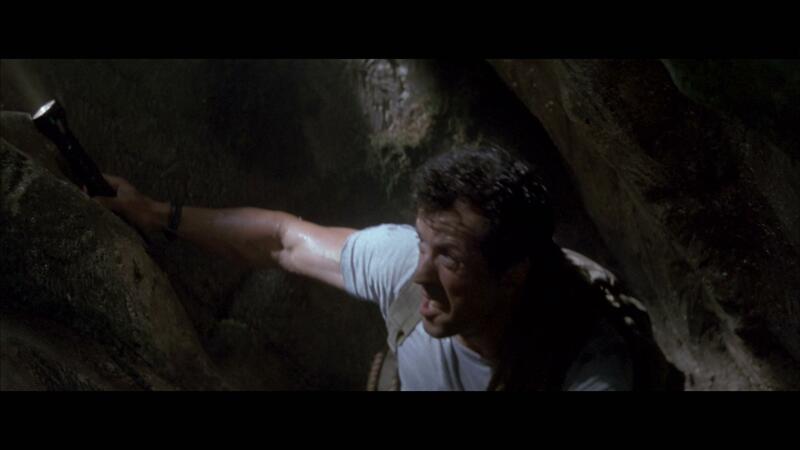 Having received a 65% approval rating on Rotten Tomatoes based on the 52 reviews that were submitted, the critical consensus reads, “While it can’t escape comparisons to the movies it borrows from, Cliffhanger is a tense, action-packed thriller and a showcase for the talents that made Sylvester Stallone a star.” It was also nominated for Worst Picture, Worst Supporting Actor (John Lithgow), Worst Supporting Actress (Janine Turner), and Worst Screenplay at the 14th Golden Raspberry Awards. 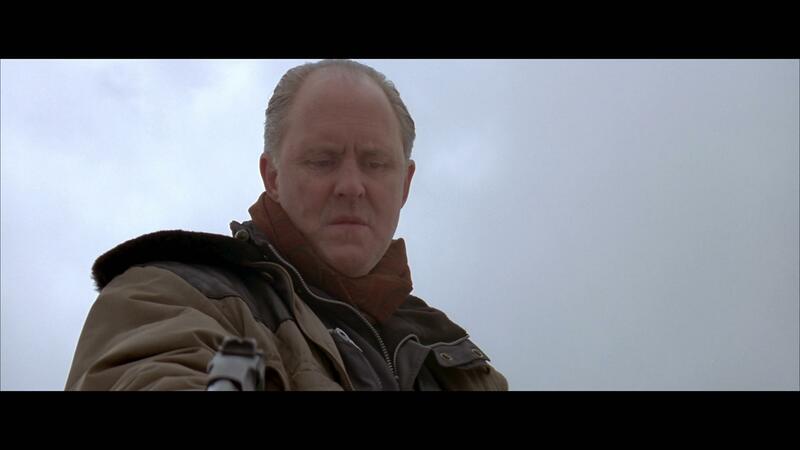 Although most people enjoyed Lithgow’s performance, he was criticized for his inauthentic-sounding English accent, especially when next to narrative English actors Fairbass and Goodall. The film was considered to be a box office hit. For its British cinema release, the film was cut by over a minute, then by a further 16 seconds on the video and DVD to gain a ’15’ certificate. Chief victim was the scene where Delmar beats up Tucker, but other cuts included aggressive strong language and other moments of violence. However, the 2008 DVD release was passed ’15’ with no cuts made. Around 1994, TriStar Pictures planned to make a sequel of the film titled The Dam (or Cliffhanger 2: The Dam), which would have Stallone’s character Gabe Walker fighting against terrorists who had taken over the Hoover Dam, but it never went beyond the development stage. In 2008, once again there were plans to make this sequel, and even Stallone was interested, but it was cancelled. 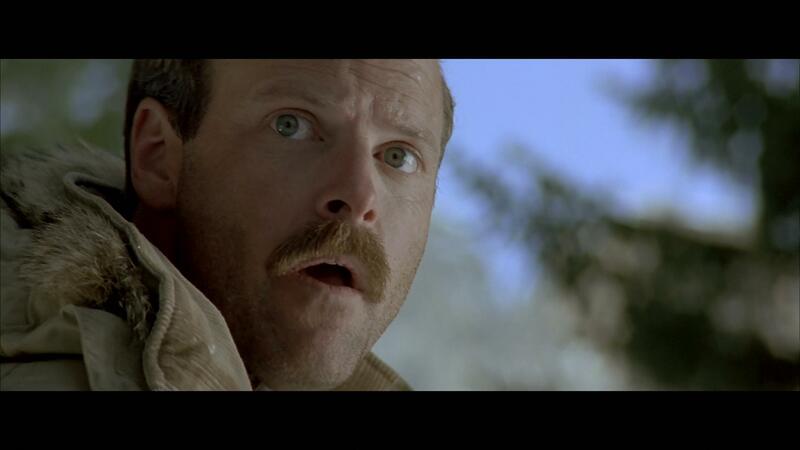 Cliffhanger is a movie, that while it’s been many years since I’ve seen it, is somewhat of a guilty pleasure of mine as it brings a good amount of suspense, and has a storyline that certainly will grab your attention and hold onto it straight through to the end. Not to mention, only Stallone is capable of pulling off the shorts and tank top in the cold, snowy weather that you see in the mountain range; so that part is slightly entertaining. The 4K UHD release of Cliffhanger offers a presentation that, while it does show a lot of the photographic challenges that were had during filming, offers a considerably new, fresh and absolutely breathtaking experience that really can only be described as being impeccable and almost difficult to describe. Everything down to the minute details of the snow, the rocks, or the trees absolutely shined with this release as it offers an absolutely amazing and natural presentation. The boost in the color details were very well defined, and helped improve the overall experience. Packaged with an all out immersive Dolby Atmos audio track, the 4K UHD release of Cliffhanger absolutely packs a punch as it rips through home audio systems. Everything about this audio track is pleasing to the ear as the transitions from channel to channel were effortless, and did a phenomenal job at placing you right in the middle of everything. The dialogue is spoken cleanly, ensuring that it takes precedence over the audio effects and ensuring that everybody was able to be heard and understood without any need to adjust the volume levels as it progressed. 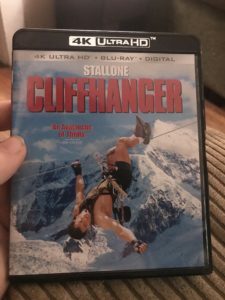 The 4K UHD release of Cliffhanger comes packaged in your standard two-disc 4K UHD amaray case. 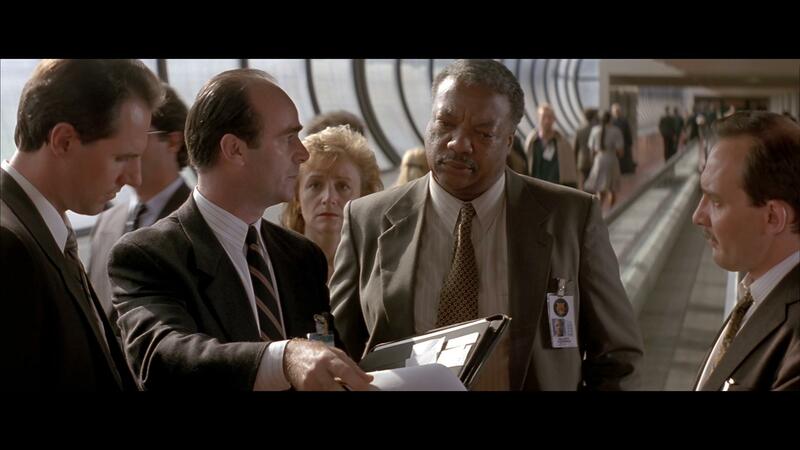 Within that case, the standard 4K copy and the standard Blu-ray copy of the movie. 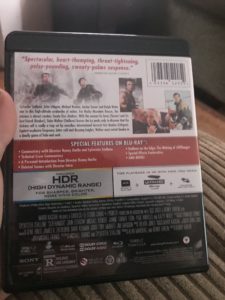 Neither of the discs feature any artwork; but, there is a digital copy redemption pamphlet included as well as a slipcover that’s been made available during the original pressing of the release. Unfortunately, my copy is not from the first pressing, so I did not receive a slipcover with my purchase. 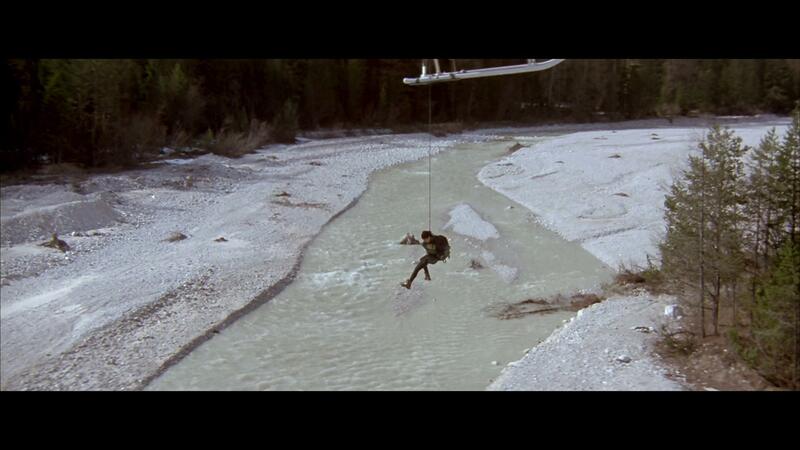 Overall, I was extremely impressed with the 4K UHD release of Cliffhanger. Personally speaking, it was definitely worth the pickup as it was a title that I was seemingly missing from my personal collection and it had been something that I’d last seen during the VHS era days. The visual and audio presentation of the 4K release were absolutely spectacular, and really allowed for it to be another feature piece for my home theater setup. It is a shame that there was no effort put into the supplemental contents of the release, and that Sony had opted to go with a simple copy/paste of the material that they had released roughly nine years ago. If you’re considering this release for your collection, I would absolutely recommend grabbing it if you already don’t have the previously released Blu-ray copy. Cliffhanger is available on 4K UHD today.